Yesterday, I reported to you about how I had purchased 1200 shares of AFFX stock at $21.82 and when I wrote it up I was 'under water' by about $.20/share. I hung in there and sold most of my shares late in the day: 400 shares at $22.09, 300 shares at $22.18, and 290 shares at $22.07, leaving me 210 shares of AFFX remaining in my trading account. The stock is just above break-even and if it dips below that level, I shall be selling my remaining shares. Otherwise, I shall manage it just like any other position in my account. Thanks again for visiting. If you have any comments or questions, please feel free to leave them on the blog or email me at bobsadviceforstocks@lycos.com. 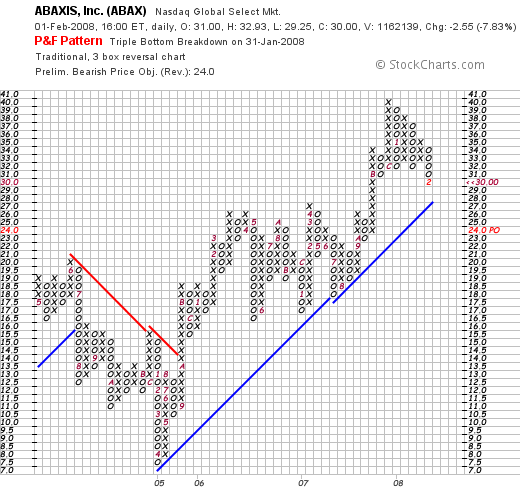 Earlier today I sold my 180 shares of Abaxis (ABAX) at $31.2754/share. I did this on the weakness of the stock and some fundamental news that disappointed. These shares were purchased 10/25/07 at a cost basis of $28.29, so I had a gain of $2.99 or 9.5% since purchase. This was actually my second sale of Abaxis--30 shares were sold 12/11/07 at $36.37 for a gain of $8.08 or 28.6% since purchase. Abaxis (ABAX) closed at $30.00, down $(2.55) or (7.83)% on the day. With a single partial sale at the 30% appreciation level, I generally would allow a stock to decline to 'break-even' before bailing. But the stock appeared to be acting rather sick the last few days and with the stock trading sharply lower on a earnings report that disappointed, and with me a nervous nellie with still some margin balance on the books, I thought it was time to part company. As noted, ABAX reported 4th quarter results after the close of trading yesterday. They came in with revenue of $25.7 million (under the $26.5 million expected by analysts according to Thomson Financial) and earnings of $3.2 million or $.14/share (under the $.16/share expected). The disappointment took its toll on the stock and weakness ensued. The 'point & figure' chart from StockCharts.com doesn't really look that bad. The long-term rise in the price appears intact. Thanks so much for visiting. I have my portfolio management rules but I also reserve the right to sell stocks when something 'fundamental' is announced, like a 'miss' in the earnings. With the market and me both quite skittish and volatile, I chose cash over equities and didn't want to see my gains continue to disappear. I hope it was the right decision! Earlier this morning, as I mentioned in the previous post, noting that the market seemed to be gathering steam with the announcement of the Microsoft pursuit of Yahoo, I decided to check the list of top % gainers on the NASDAQ where I found an old favorite of mine moving sharply higher, Affymetrix (AFFX). I say "old favorite" because I first posted Affymetrix (AFFX) on Stock Picks Bob's Advice on January 27, 2005, three years ago (! ), when the stock was trading at $40.62/share. The stock is down sharply since that date and NO there haven't been any stock splits that would explain the lower price today. Being rather stubborn at this trading situation, I thought I would give it another go and purchased 1200 shares of AFFX at $21.82. It was my thought that based on the announcement last night of 4th quarter 2007 results ended December 31, 2007, that the company might have enough price momentum to continue moving higher. As with my other 'larger' trades, I would hopefully be able to shed a considerable number of these shares and leave a smaller position in my Trading Account. Anyhow, that was my plan. So far it isn't panning out perfectly. AFFX is trading, as I write, at $21.60, up $1.54 or 7.68% on the day--about $.20 below my purchase price. "...engages in the development, manufacture, sale, and servicing of consumables and systems for genetic analysis for use in the life sciences and clinical healthcare markets. It offers GeneChip system and related microarray technology platform for acquiring, analyzing, and managing genetic information. 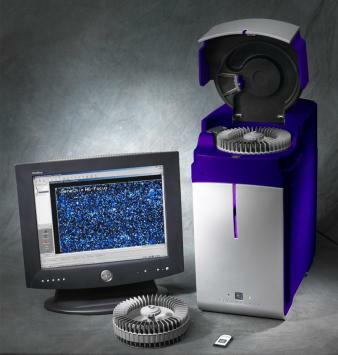 The company's GeneChip microarray platform includes disposable DNA probe arrays containing genetic information on a chip; reagents for extracting, amplifying, and labeling target nucleic acids; a fluidics station for introducing the test sample to the probe arrays; a hybridization oven for optimizing the binding of samples to the probe arrays; a scanner to read the fluorescent image from the probe arrays; and software to analyze and manage the resulting genetic information." For the quarter ended December 31, 2007, revenue came in at $107.6 million, up from $104.2 million in the same quarter in 2006. Full year revenue came in at $371.3 million, up from $355.3 million in 2006. Net income worked out to $12.8 million or $.17/diluted share. This is compared to net income of $8.68 million or $.13/diluted share last year. The company beat expectations on earnings but did miss on revenue. The 'street' had been expecting a profit of $.16/share on revenue of $109.2 million per Reuters estimates. However, the company guided higher for 2008 with revenue expected to be $505 to $525 million (analysts had projected revenue of $403 million). This relatively optimistic report yesterday was enough to push the stock higher in early trading today. Checking the Morningstar.com "5-Yr Restated" financials, we can see why this stock is not a perfect fit for my strategy and yet with the latest report appears to be changing the recent pattern of financial performance. Here we can see the nice growth in revenue between 2002 and 2005 from $290 million in 2002 to $368 million in 2005. However, revenue dipped to $355 million in 2006 and has only bounced back to $368 million in the trailing twelve months (TTM). Earnings have also been erratic. While improving from a loss of $(.10)/share in 2002 to $.96/share in 2005, the stock then dipped to a loss of $(.20)/share in 2006 and improved once again into the black at $.13/share in the TTM. Free cash flow which was $27 million in 2004 and $24 million in 2005, dipped to a negative $(48) million in 2006 and improved to a $(5) million in the trailing twelve months. The balance sheet is solid with $124 million in cash and $276 million in other current assets. This total of $400 million when compared to the $79.5 million in current liabilities yields a very strong current ratio of just over 5.0. In addition, there are $135.2 million in long-term liabilities reported by Morningstar. And what about the chart? 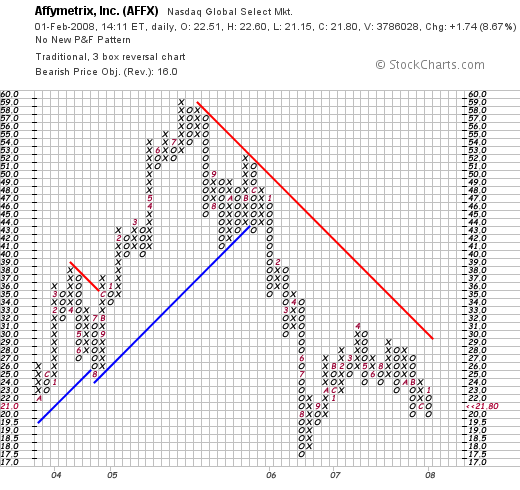 Looking at the StockCharts.com 'point & figure' chart on AFFX, we can see that the stock moved nicely higher from $22 in October, 2003, to a high of $59 in July, 2005. Since then the chart broke down when the price dipped to $43 in Decmber, 2005, and has headed lower since to a low of $17.50 in August, 2006, to a recent high of $31 in April, 2007, and has not convincingly moved in an upward direction. I bought shares in AFFX earlier today for a 'trade' and hopefully to end up with a new position in my Trading Account. The stock is slightly under my purchase price yet appears to have good support. The earnings announcement was strong and the guidance was superb. Otherwise, the stock has performed poorly since I posted it back in 2005. The chart looks weak and I believe is related to the inconsistent performance the past few years as documented by the Morningstar report. The strength of the stock is based on the belief that things are going better in the future. Certainly the concept of gene mapping and the business in that field is likely only to continue to show strong prospects. Whether I continue to hold these shares is problematic. Wish me luck! Meanwhile, I shall sit back and wait to see how this works out. A few moments ago I sold my 103 shares of Cerner (CERN) remaining in my Trading Account at $47.32/share. These shares had been purchased 2/2/07, almost exactly one year ago, at a cost basis of $49.76/share. Thus I had a loss of $(2.44) or (4.9)% on this purchase. I sold these shares simply because after a single sale of Cerner at a gain (I had already sold 17 of my 120 shares of Cerner on 10/11/07 at a price of $64.20 representing a gain of $14.44 or 29% since my purchase), I push up my 'mental stop' (I still don't do this automatically) to break-even. Cerner dropped below my break-even or cost per share and thus needed to be sold per my portfolio strategy. I do not have 'permission' to add a new position. But in fact I did enter a trade which I shall discuss shortly separate from this 'portfolio management' strategy. Since the company reported fairly strong earnings yesterday after the close of trading but revenue came in at $394.5 million, below analysts expectations of $411.8 million for the quarter. Even though earnings at $.52/share came in ahead of expectations of $.47/share, the stock took it on the chin. And I sold my shares as planned. Going forward the company estimated first quarter earnings of $.43 to $.44/share on revenue of $390 to $400 million. Analysts are looking for revenue of $404.91 million, so again, this is below expectations. However, the company did guide earnings for the first quarter above analysts' expectations of $.41/share. Simply put, the market is unwilling to accept any imperfection in the earnings announcements because everything is so 'skittish'. Thanks again for stopping by and visiting! If you have any comments or questions, please feel free to leave them on the blog or email me at bobsadviceforstocks@lycos.com. If you get a chance, be sure and visit my Covestor Page where my Trading Portfolio is monitored and evaluated, and my SocialPicks Page where all of my stock picks are also reviewed. Furthermore, consider stopping by my Podcast Page where you can listen to me discuss some of the many stocks I have reviewed right here on the blog! 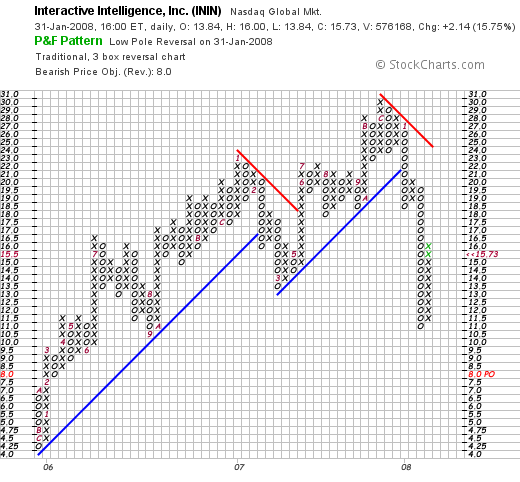 Interactive Intelligence (ININ) "Trading Transparency"
Fortunately my 'intuition' about the direction of the market this morning was correct and Interactive Intelligence (ININ) has continued to move higher. Again with my significant margin level (lower than it has been though), and my desire to sell my 'excess shares' so that I could leave a position for my Trading Account, I sold 850 of my 1200 shares of ININ. 500 were sold at $16.14 and 350 shares were sold at 16.1901. Thus, the average sale price of these 850 shares was $16.16. All of these shares were purchased this morning at $15.75, so this represented a gain of $.41/share or 2.6% since purchase. Since there were 850 shares involved, this was a gain on this trade of $348.50 on this transaction. Regarding the remaining shares, since I like what Interactive Intelligence has reported, these shares will remain in my Trading Account as a new position. On the downside, I plan on selling these shares should they decline to break-even (since I have sold these shares more-or-less once). On the upside, I plan on selling 1/7th of this position should it appreciate to a 30% gain. Thanks again for visiting! If you have any comments or questions, please feel free to leave them right on the website or email me at bobsadviceforstocks@lycos.com. If you get a chance, be sure and visit my Covestor Page where my Trading Portfolio is monitored and analyzed, my SocialPicks page where all of my stock picks are monitored and reviewed, and my Podcast Page where you can download some 'radio shows' that you can play on your mp3 player. Earlier this morning, seeing an 'old favorite' of mine, Interactive Intelligence (ININ) on the list of top % gainers on the NASDAQ, I chose to stick my toes once more into the trading world and purchased 1,200 shares at $15.75. This is once again my 'trade position' and I do not plan to sit with the entire 1,200 shares long-term. If the stock works out for me by moving higher yet, than I shall be selling approximately 900 shares and leaving 300 for the portfolio. Otherwise, I shall be unloading the entire position at the smallest loss I can tolerate. As I write, ININ is trading at $15.85, up $2.26 or 16.63% on the day. I use the term 'old favorite' to indicate that this is a stock that I have reviewed previously. In fact, I posted ININ on Stock Picks Bob's Advice on June 30, 2006, when the stock was trading at $14.27. The stock has had a rocky course since then and has been under some significant pressure price-wise recently. Let me share with you some of my thinking regarding this trade. Feel free to comment and share with me your own ideas as I am more of an 'investor' than a short-term trader. The market sold off yesterday after a spike in the Dow on the back of the .50% Federal Funds rate cut. The market opened up today sharply lower, but appeared to be steadily reversing course and moving to the upside. It was in this environment that I looked to my lists of top % gainers, hoping to find something first of all that I would be familiar with and next that had some fundamental news that might continue to drive the stock higher. As is often the case, from my experience, it was earnings news that pushed the stock higher today. After the close of trading yesterday, ININ announced 4th quarter 2007 results. Revenues came in at $109.9 million, up 32% from $83 million in the same quarter the prior year. Net income was $10.3 million or $.53/share which included a $(840,000) expense regarding stock options as well as a $8.1 million one-time benefit. Taking these one-time expenses and gains out of the picture, which is probably a very prudent move for analysis, leave us with a non-GAAP result of net income of $3.1 million or $.16/share, compared to last year's non-GAAP result of $2.1 million or $.11/share. This is still a very strong report. Checking the Morningstar.com "5-Yr Restated" financials, we can see that this improved earnings/revenue picture was a bit of a turn around from what some year-over-year declines. That is, while revenue has continued to steadily improve, earnings did dip in the last twelve months from $.56/share to $.41/share. Free cash flow has been positive and the balance sheet appears solid. Reviewing the StockCharts.com 'point & figure' chart on ININ, we can see that the stock has been under tremendous pressure. From December, 2005, when the stock was trading at around $4.25 until December, 2007, when the stock peaked at $31, the stock was at that time trading steadily higher. Only since the first of this year, the stock has taken a beating along with the rest of the market, dipping from $27 to a low of $11 just days ago. The stock appears to be 'fighting back' but overall the chart is not encouraging long-term. It would be nice to see this stock trade over $25 and establish new support levels before feeling more confident that this technical picture has reversed. Certainly the latest quarterly report is helpful in this regard. Dover Corporation (DOV) "Trading Transparency"
I think that interview with the Associated Press went right to my head. Or perhaps it is just very dangerous to trade in these volatile waters. Bullish advances turn on the dime like they did today and turn a profit into a loss in minutes. I should have known better but after this "trade" turned south, I pulled the plug and took a loss. Even though I like this stock. In a nutshell, I purchased 800 shares of Dover (DOV) at $42.184. With the market heading south and Dover pulling back from its large move to the upside, I started unloading my shares--selling 100 at $41, 100 at $41.01, 200 at $41.07, and 400 at $41.18. That was a loss of a little over $1.00/share, or somewhere north of (2)% on these shares in a matter of minutes. even though I personally just lost a handful of change on this stock and I do not currently own any shares. It still deserves a spot in my blog. Dover made the list of top % gainers on the NYSE today, closing at $41.04, up $2.66 or 6.93% on the day. "...together with its subsidiaries, manufactures industrial products and components, and manufacturing equipment in the United States and internationally. 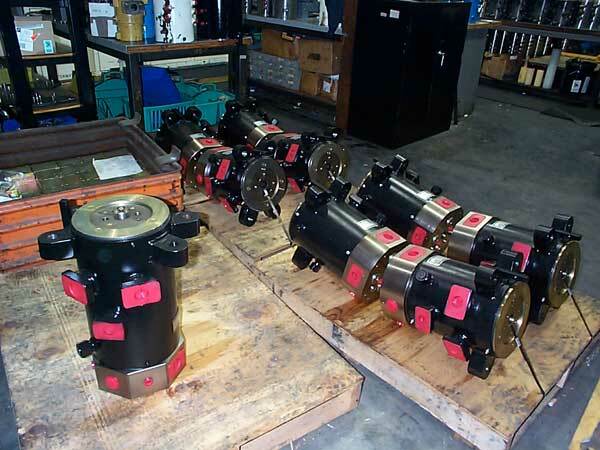 It operates in four segments: Electronic Technologies, Engineered Systems, Industrial Products, and Fluid Management." What drove the stock higher today was an outstanding fourth quarter earnings report. Sales climbed 11% to $1.86 billion, exceeding forecasts of $1.8 billion. Net earnings jumped 56% to $185.4 million or $.94/share ahead of the $118.5 million or $.58/share a year earlier. Earnings from continuing operations came in at $.86/share 4 cents ahead of expectations. Longe-term, the Morningstar.com "5-Yr Restated" financials look outstanding with steady revenue growth, steady earnings growth, steady dividend growth (! ), and a steady number of outstanding shares. Free cash is solid and has grown in the past few years and the balance sheet appears solid. Valuation-wise, checking the Yahoo "Key Statistics" on DOV, we can see that this is a large cap company with a market cap of $8.16 billion. The trailing p/e is cheap at 14.18 and the PEG works out to an estimated 0.79. Even so, there are 6.26 million shares out short as of 12/26/07, representing 6.8 trading days of volume. The company pays a dividend of $.80/share yielding 2.1%. The last stock split reported on yahoo was a 2:1 split way back in December, 1997. Probably the weakest part of this analysis is the chart. 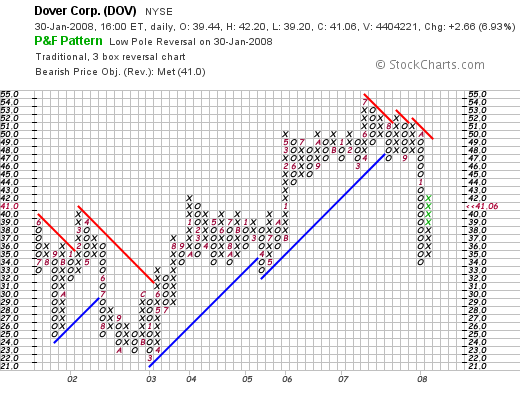 Looking at the 'point & figure' chart on DOV from StockCharts.com, we can see a very nice move higher from $22.00 in March, 2003 to a hnigh of $54 in july, 2007. The stock broke down in October, 2007, and is now struggling to resume its upward momentum. In any case, I got 'whipsawed' and got caught in the violent volatility of this stock market that moved sharply higher on the Fed rate cut and then turned on a dime and dropped lower. Yikes. 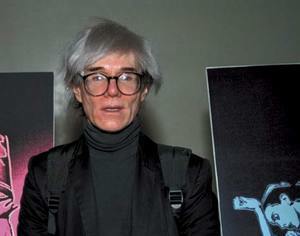 Andy Warhol predicted that everyone would 'get their 15 minutes of fame'. Thanks to my friends at Covestor, my name was forwarded to Tim Paradis who writes business stories for the Associated Press. I was interviewed as an "amateur investor" which I believe fairly accurately reflects my activity :). It was fun to get some publicity, but I hope I haven't used up all of my minutes. Maybe there are a few left. Meanwhile, back to blogging. P.S., you can view the article here. As I have blogged earlier, I purchased a large position of Silicom (SILC) yesterday and as the stock has moved higher, I have been selling off 'pieces' of this investment and now, with 350 shares remaining, I am leaving it as a new position in my Trading Account. Earlier today, with 900 shares left of my 2000 share purchase that I picked up yesterday at a cost basis of $13.67, I sold 300 shares at $14.25, and then later in the day sold 250 shares at $14.2101, leaving me the 350 share position which constitutes the new position. If my SILC shares dip to my 'break-even' point or lower I shall be selling the shares. On the other hand, if the shares appreciate to the 30% appreciation level, I shall be implementing my 1/7th of my position sale as I do with my other holdings. Thanks so much for stopping by and visiting! If you have any comments or questions, please feel free to leave them on the blog or email me at bobsadviceforstocks@lycos.com. If you get a chance, be sure and visit my Covestor Page where my Trading Portfolio is analyzed, my SocialPicks page where my stock picks are recorded and analyzed, and my Podcast Page where you can download programs discussing some of the various stocks and investing strategies from my blog. Have a great rest-of-the week, and if you are in the Midwest like I am, drive carefully and stay warm. There is a lot of cold air coming through. Continuing my brief update on my Silicom Stock (SILC) which I purchased this morning. I have now sold 400 shares twice and just sold an additional 300 shares of SILC at $14.47 leaving me 900 shares remaining in my Trading Portfolio. I would like to leave 300 or 400 shares longer-term if possible as a small position so that would mean either 600 or 500 shares remaining to be sold as needed. I have been very lucky with this stock and maybe should have held on longer, but I am happy to continue to eke out small gains as this unfolds.